The Beauty in the Word: Rethinking the Foundations of Education by Stratford Caldecott. Published in 2012, Caldedcott’s Beauty in the Word serves as a sequel to his 2009 book, Beauty for Truth’s Sake, in which he examines the necessity and the inherent beauty of the mathematical arts. Going a step further, The Beauty in the Word studies all three stages of a classical curriculum, The Trivium or “three ways”. However, Caldecott writes of the Grammar, Logic, and Rhetoric stages of the Trivium in accessible, human terms-Thinking, Remembering, and Communicating. His analysis does not stop there. Caldecott continues by ascribing to each stage of the Trivium a member of the Holy Trinity, making this book a must read for all educators who believe that God is the source and the end of their mission. Buy a copy here. 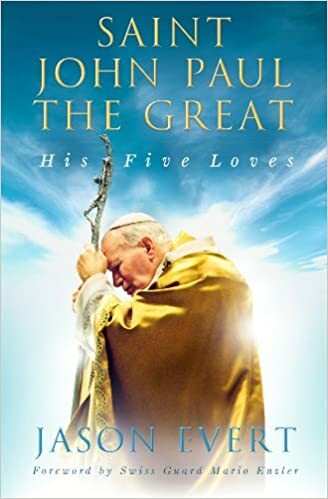 St. John Paul the Great: His Five Loves by Jason Evert. A French novelist once wrote, “Tell me what you love, and I will tell you who you are.” Noted Catholic evangelist Jason Evert has painstaking and lovingly compiled the stories of bishops, priests, laymen, students, and Swiss Guards who knew St. John Paul II and who have uncovered hidden treasures from the saint’s life. Through encountering this great saint, the reader encounters Christ. This book is a beautiful introduction to a holy life which has changed forever the course of human history and has inspired the creation of a little school in Green Bay, WI. Buy a copy here.